A unique spin on a summertime classic! Buffalo Ranch Fish Tacos are a fast and easy choice for a healthy weekday meal. Remove from oven and cut each fillet lengthwise into 2 or 3 strips (about 1/2" each). Meanwhile, mix Ranch dressing and Buffalo wing sauce until smooth. Warm tortillas in microwave for 45 seconds. Spread each tortilla with the Buffalo Ranch mixture. Place one or two fish strips on the end of tortilla. 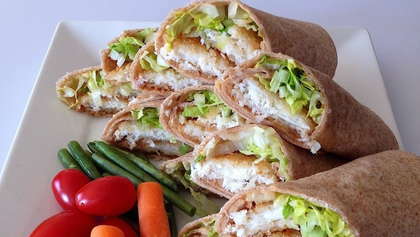 Sprinkle shredded lettuce on fish and roll tortilla into a wrap. Cut each wrap on the diagonal. Serve with raw veggies and extra sauce for dipping. *Optional - add some shredded cheese to the wrap for extra flavor.